After the 2016 Presidential election, any enthusiasm people had about voting was torn away. How could Donald Trump still be president after it was exposed that the election was fraught with Russian meddling, and with the majority of votes —more than 3 million— being cast for Hillary Clinton? Many of us lived in denial up until the moment of the inauguration. It was truly an election that made you wonder what the point was in voting. But then reality hit like a ton of bricks. Yes, we’re living in the time of Donald Trump, and yes, we’re angry, but that doesn’t mean we give up control and let other people rule — quite the opposite, in fact. In times when it feels like so much is out of our control, voting is one of the few means we have to exercise decision-making power. The reality is that voter turnout is historically low in this country. In turn, when voter turnout is low, every single vote cast counts more. 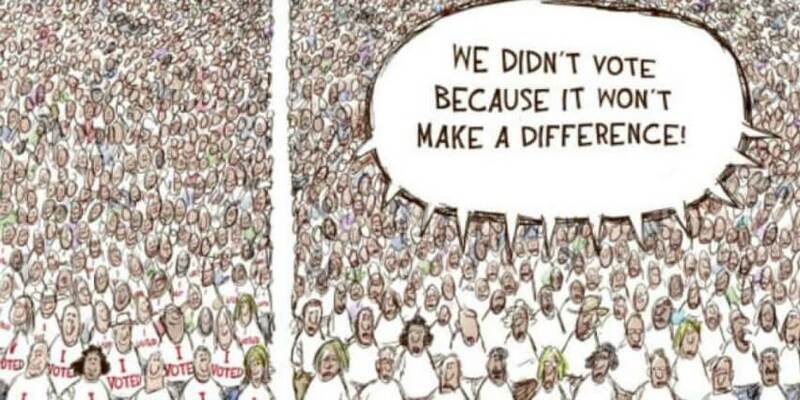 A single vote can make the difference. Elections can be so close that they result in a tie, like in Irvington, NY or in Virginia this year. One was decided by the flip of coin and the other by the drawing of one name out of a can. NYS Senator Andrea Stewart Cousins lost by 18 votes in 2004, and then turned around and won in 2006. In the 2016 New York State Senate race for the 8th district seat, Democrat John Brooks beat Republican incumbent Michael Venditto by only 33 votes out of 128,965 votes cast. Even more recently, the 2017 Alabama Special Election for the U.S. Senate seat vacated by Attorney General Jeff Sessions showed the importance of individual votes. The unimaginable actually happened: Alabama voters elected a Democrat to the Senate. Doug Jones claimed victory over his Republican opponent, Roy Moore. Jones won by around 20,000 votes. That was the first time a Democrat won in Alabama in decades. If those voters had stayed home because they thought a Democrat could never win, a child molester would have been elected. Still not convinced that going to the polls makes a difference? In September of 1975, the closest Senate election ever took place. After two separate recounts, the original win by Wyman of 355 votes was narrowed down to a two (2) vote margin. This is the best possible example of why the votes of individual citizens matter. In this race every vote truly did count and matter. A good time to sit out on an election is NEVER. Every election from school board to president matters. You have to start at the base to build a pyramid. Granted, it’s impossible to know when your vote could change history. But do you really want to risk it? After all, if you sit out an election, you’re giving up control of your life to others. You’re letting go of the only control you have of who governs you and how.